Published in 1874, Far from the Madding Crowd is often considered Hardy's first masterpiece. The story follows Bathsheba Everdene's life in the rural village of Weatherby, where she has come to live after inheriting her wealthy uncle's estate. 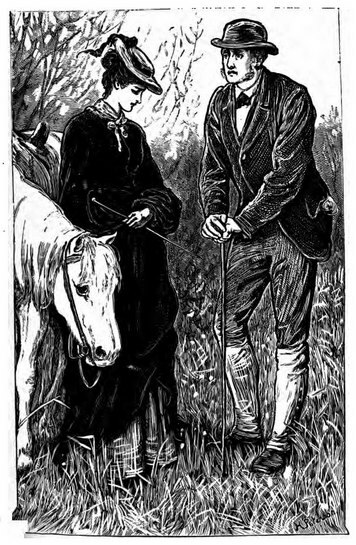 The story is one of successive courtships, starting with Gabriel Oak, a young shepherd, but soon followed by the somewhat repressed William Boldwood, an older but prosperous farmer, and finally the dashing Sergeant Francis "Frank" Troy, who returns to Weatherby where he has a love interest in Bathsheba's former servant Fanny Robin. The story evolves through a series of unexpected twists and turns where fate seems to be more often determined by chance than by choice. Chapter LV: The March Following -- "Bathsheba Boldwood"
Return to the Thomas Hardy library.